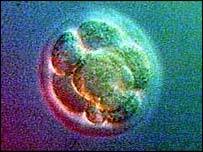 The incarnation began at conception showing that God considers embryos human from that point. Although they clearly don't have the conscious awareness of fully formed infants, hybrid embroys ethically involve tampering with and then destroying a human being. Genesis 1 portrays God creating all animated beings according to distinct categories. To mix them in this way is not a reversal of the effects of the fall as genetic enginerring might be, but is an alteration of the created order itself. Atheistic evolutionism has left us seeing little difference between human beings and animals. Whereas scipture asserts humanity alone as in God's image, above the rest of creation and as holding the greatest dignity in being commissioned as his vice-regents in this world. Our consciences have been so seared that we do ot see it; but we should surely react against any form of tampering with, destroying and so deconsecrating something set-apart for such a high calling. It is a rebuke indeed that Christians will balk at the desecration of churches, modern translations they feel dishonour the Bible and flippancy in forms of worship, but not at this. The arguement that such research will alleviate suffering is a questionable one not because it won't, but because this should never justify a morally wrong act. If point 1 above stands, then at the ethical level it is no more justified to tamper with and destroy a human embryo to further research than it is with an adult human. Indeed it may be more ethically suspect as the adult could at least volunteer. The situations are not equivalent and I am cautious of being overly emotive, but surely this arguement was used to justify human experimentation on Jews under the Third Reich. Moreover, placing our research eggs in this basket, means less funding or motivation to seek other ways of treating deseases such as altzimers. The Lord calls us to protect the rights of those who are uncared for and cannot speak for themselves. Embryos surely fall into this category. Every one destroyed is a human life with the potential for full mature existence that is not allowed to flourish. Even if we are unsure that embryos should be treated as human beings, we only need to accept the possibility that this might be so to hold back on this sort of research. The mere possibility that we might be tampering with and destroying what to God is human life, should be suffiicient a sufficient check.